While armistice talks took place on the various military fronts in the autumn of 1918, the fighting continued. On the Western Front, where the Allied commanders feared that a premature armistice would allow Germany to renew the war in 1919, the conflict lasted into early November. Fierce battles on the Italian Front continued until as late as 27 October, when British and Italian troops crossed the River Piave and the Austrian army finally collapsed. In two remote regions - Albania and East Africa - the Central Powers were still carrying the fight to the Allies weeks after the last armistice had been signed. 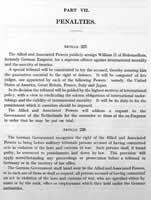 The first of the Central Powers to sue for peace was Bulgaria. The terms of the armistice agreed with the Allies on 29 September 1918 included the evacuation of Bulgarian troops from all Greek and Serbian territory and Allied occupation of certain strategic points within Bulgaria. Armistice talks between British and Turkish negotiators began on 26 October on a British warship stationed at Mudros, a port on the Greek-owned island of Lemnos. The agreement signed four days later forced Turkey to demobilise its army, open the Dardanelles and Bosphorus to Allied shipping and evacuate its Arab provinces. On 3 November, with Vienna close to revolution and the Habsburg empire in tatters, Austria, too, signed an armistice. Fighting on the Italian Front stopped a day later. Negotiations for the final armistice, with Germany on the Western Front, began in the forest of Compiègne on 9 November 1918 - the same day that Kaiser Wilhelm II abdicated and Germany was declared a republic. The leader of the German delegation, Matthias Erzberger, pleaded in vain for lenient terms. The armistice that came into effect on 11 November ordered the immediate German evacuation of Belgium, France, Luxemburg and Alsace-Lorraine, the Allied occupation of western Germany and the emasculation of the German army. Although separate peace treaties were to be concluded with all of the defeated powers, the Paris peace conference, which opened on 18 January 1919, was dominated by wrangling over Germany's future. In both Britain and France, there were widespread calls for a punitive peace settlement. The German delegation was in a hopeless negotiating position. Not only were parts of Germany now under Allied occupation, the Allies - at the insistence of the French - continued to enforce the trade blockade until the peace treaty was signed. Belated British signs of a less vengeful approach, expressed most clearly in Lloyd George's Fontainebleau memorandum in March 1919, were summarily dismissed by the French delegation. After much protest, and conscious of the 'overwhelming force' arrayed against it, Germany signed the Treaty of Versailles with the 27 'Principal Allied and Associated Powers' on 28 June 1919. Under its terms, Germany accepted (along with its allies) sole responsibility for the outbreak of war in 1914. It lost territory to its east and west, as well as all of its colonial possessions, and was required to pay reparations to the countries it had attacked. The German army, navy and air force were all disbanded. Among the Allied delegations in Paris, critics of the treaty's severity - such as the British economist John Maynard Keynes - constituted a small minority. In Germany, where few had accepted the reality of defeat, Versailles was regarded as an indelible stain on national honour. None of the other peace treaties was quite so controversial. With the Habsburg empire long since defunct, the Treaty of St Germain (10 September 1919) confirmed Austria's losses to Italy, Romania and the newly formed states of Czechoslovakia, Poland and Yugoslavia. A nine-month Communist dictatorship in newly independent Hungary delayed - until 4 June 1920 - the signing of the Treaty of Trianon, by which the Hungarians lost land to Czechoslovakia, Romania and Yugoslavia. In the meantime, Bulgaria had signed the Treaty of Neuilly (27 November 1919), ceding territory to Greece, Romania and Yugoslavia. The last of the peace treaties, the Treaty of Sèvres with the newly formed republic of Turkey, was signed on 10 August 1920. However, the Turks quickly reneged on promises of autonomy for the Kurds and independence for Armenia and, in August 1922, recaptured control of Smyrna, given to Greece two years before. The boundaries of western Turkey were thus not finally resolved until the signing of the Treaty of Lausanne in July 1923. CAB 21: Various material on the Paris peace conference, 1919. CAB 29: Various material on the Paris peace conference, 1919. FO 211/517: Peace treaties between the Allies and the Central Powers, 1919-20. GFM 3/2080: Various material on the German delegation at Versailles, 1919. WO 106/412: Terms of the armistices agreed between the Allies and Austria-Hungary, Germany and Turkey, 1918.